Software client for Mac and Linux. Live odds calculator used for all-ins. Great software package with 3D tables. Make player notes and set colors. High traffic in tournaments and ring games. Supports Five Card Draw games. Most of the traffic is in Texas Hold'em. No special game modes such as Turbo. Customer support could be better. EuroPoker is yet another great poker room with great software. You get a very solid software package with industry leading features and superb graphics. Add to that a really high traffic rate of users, who unfortunately reside mostly in Texas Hold’em No Limit. The tournament traffic is also good, with thousands of players in various scheduled games, sit n goes and alike. The signup bonus is above the average and a good reason for you to register and try to claim it, but as far as promotions go, this network lacks what the real giants offer. If you are a Mac or Linux user, you will be happy to learn that this room also offers support through instant download software, so you will be able to play at work, at home or on foot, no matter what. Euro Poker offer a very solid software package for its poker clients. It is definitely one of the best in the industry due to its highly sophisticated graphical interface. Some may dislike the 3D:ish feeling, but as with all other clients, it’s just a matter of time before you get used to it. As for functionality, this is the good part as you can switch many options on and off. Additionally, you can view your statistics and characterize your opponents with color tags and alike, to help you keep track of who they are and how they play. The only downside of the client is the speed during game play. We dislike the long wait times between bets, folds, wins and so on, which only results in meaningless delays. On the other hand, such delays may prove helpful if you play at multiple tables. We also want to add that there is a Black Jack client included, which is a great addition to anyone who wants to beat the bank. EuroPoker is part of a large network and therefore attracts a lot of players. It sometimes fills up 15,000 players at peak hours, which is more than what 95 percent of what other poker rooms hold. A large amount of these players are found at ring game tables, usually as high as 70 percent. The majority of the traffic is from Texas Hold’em games. The aggressive marketing of EuroPoker has provided for a good increase in the medium stakes and high stakes, which is good. There’s a big bunch of tournament players at Euro Poker. Although EuroPoker offer only a few special event tournaments, you will find quite a lot of traffic in sit n go games and scheduled multi table tournaments. Games vary from $5 buy-in to $100. On the other hand, most of these are focused primarily in Texas Hold’em flavours. The variety is of the decent kind. 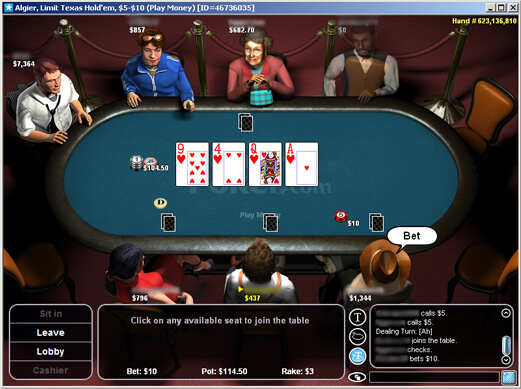 The regular Texas Hold’em games are offered in No Limit, Pot Limit and Fixed Limit, but other games such as Omaha, Omaha Hi/Lo, 7 Card Stud and 7 Card Stud Hi/Lo are also supported. The oldest game in the book, Five Card Draw is there as well, but because more than 80% of the traffic is concentrated in the Texas Hold’em games, you’ll have to be lucky to catch a game of your request. You will not find the softest competition at EuroPoker, but that does not mean that it’s completely free from bad players. In fact, there’s a lot of them, but also a few skilled. Approximately 45 percent of the players see the flop at $2/$4 and up. Lower stakes provide for up to 75% flop views. If you’re going for tournament play, go for anything below $50 in buy-in if you want soft players. EveryPoker and EuroPoker have teamed up to offer the highest bonus available, boosting your bankroll by 100% up to $2500. The regular bonus boosts you only up to $1000. Use our Euro Poker promo code free1200 when you register to claim it. Player Points, or PP:s, are collected every time you participate in ring games and tournaments. These collectible points can then be converted to exclusive prizes and private freerolls. 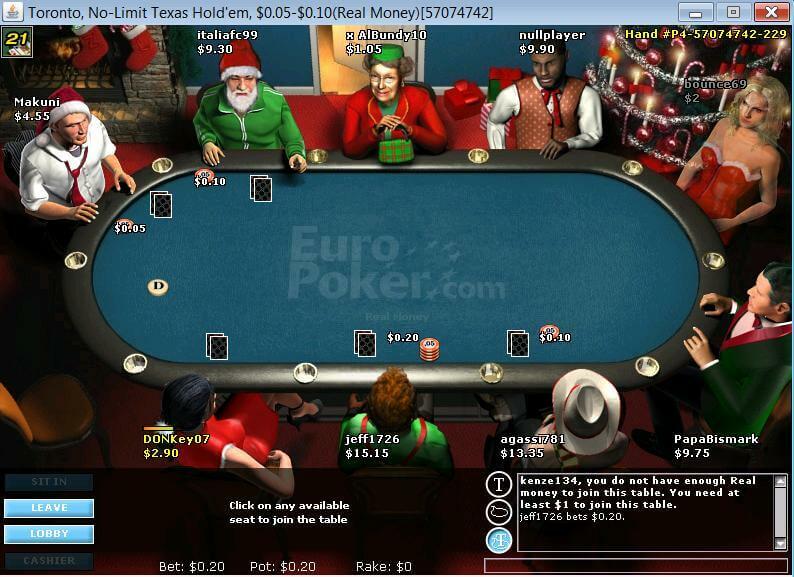 Euro Poker usually host seasonal tournaments with large cash prizes. Those of you who are into freerolls may enjoy the additions of $500 and $1000 competitions. Last but not least, if you score a royal flush with one or two cards from your own fingertips, you score up to $5000 maximum or 100 times the small blind. You can only contact EuroPoker by e-mail. The response times are usually very fast and informative. We have not heard of any upcoming live chat or telephone support. Deposits: Credit Card, NETeller, Click to Pay, FirePay, FPS Epassporte and InstaCash. Cash-outs: NETeller, FirePay, PrePaid, Click to Pay, ATM, check, courier check and FPS Epassporte.